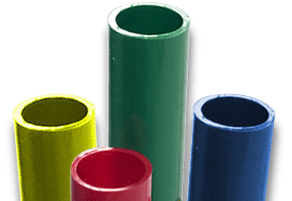 Most PVC piping comes in standard white or gray, but custom PVC colors can be used to create colorful tubing in opaque, translucent or transparent options to achieve your desired result. Colors and finishes serve an aesthetic purpose for PVC materials but can also provide additional protection including UV resistance, weather resistance and increased impact resistance. Other applications for custom PVC colors include color piping for use in aquariums, outdoor furniture, medical use, and more. Color coded plastics are a durable and permanent solution for any identification purpose and are used by a wide range of industries. Custom PVC colors are added to create vibrant colors that remain consistent throughout the entire PVC material. The process creates a high gloss that retains its color even if the surface or product is altered by drilling, cutting or scratching. Custom PVC colors are highly durable and provide additional protection from weather and UV exposure that can cause PVC and ABS plastics to degrade over time. This increased durability makes color coded plastic suitable for both indoor and outdoor use, including those involving exposure to weather, chemicals, high heat, and pressure. Crescent Plastics offers clear PVC tubing as well as PVC specialty colors to meet your customization requirements. We can accommodate high volume requests and offer a range of custom colors and different shapes including round, rectangle and square tubing. Our ABS tubing is available in sizes from 0.188” up to 4.5” in diameter and our PVC tubing is available in sizes from 1/2” to 4.5” in diameter. Crescent Plastics also offers custom diameters and lengths for our PVC and ABS tubing and can accommodate even the most creative applications. Our expert team is ready to assist with any questions you have regarding your custom PVC color project. We offer a range of custom PVC colors and finishes to meet your unique project requirements. Contact Crescent Plastics today to learn more about our custom ABS colors and PVC color matching options or request a quote.